Interested in our Assisteens Program? Assistance League is a national nonprofit organization that puts caring and commitment into action through community based philanthropic programs. We are proud to be in our 50th year of helping the greater Tustin community. Volunteers at the Tustin chapter have been dedicated to helping the less fortunate and serving our local community since 1965. Last year, we were able to help over 16,000 local children and their families by raising over $225,000 through sales at our Thrift Shop and financial gifts given by our generous supporters. Donations from friends like you help us continue funding the year‑round community projects that make a difference in the lives of families, singles, and children who are in need. 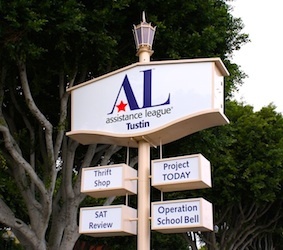 Assistance League of Tustin, a local chapter of National Assistance League and a nonprofit organization, puts caring and commitment into action through community based philanthropic programs.